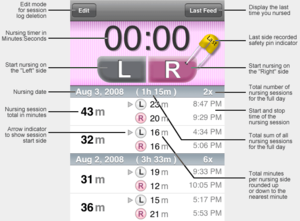 Apple iPhone Application – For Breastfeeding! I painfully remember entering in my breastfeeding and diaper schedule for the twins on PC spreadsheets that I had printed out and put on clipboards. Multiple times I misplaced the sheets, and could not remember the last time the twins were fed. My twins just started Kindergarten, and that experience seems like such a long time ago. But times have changed for the better. ANDESigned is publicizing their new Apple iPhone application – for breastfeeding and diapers. I am a big fan of moms using one device for many tasks, so this is a great idea – especially for twin moms where memory loss is part of the game. I have not tried this application, but it does have areas to store all the information per breastfeeding session. As a twins mom, I would like to know if I can modify the application to associate each twin with the side they were fed (so mom can start them on the other side for the next feeding session). No matter what, it is better then that sheet of paper I used…. I wish I’d had this app plus an iPhone back when I was nursing. Let us know if the app can be tweaked for twins! I did the same thing – I kept my own printed our spreadsheet for 9 MONTHS with my twins! I got so mad at my husband when he didn’t record a feeding, etc. Definitely would need to have twin modifications AND be able to be used by a caregiver (daddy, grandma, night nurse, nanny, etc). Trixie Tracker lets parents track sleep, diapers, breastfeeding, pumping, milk inventory, solids and medicine, and generally get on a good schedule. It’s optimized for the iPhone, and is *specifically* designed for twins and multiples. This looks so neat does anyone know of anything similar for Blackberrys? Darren can you suggest an app for the blackberry curve? can you suggest an app for the blackberry curve?